The image is exactly what I meant by rubbing work. The painter used water with emery paper to rub and get the surface as he needed. 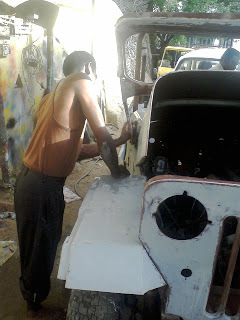 The whole painter crew was fully involved in each and every corner of the Jeep with rubbing work. Here is how the jeep looked after complete rubbing on the NC putty. Actually speaking I was seeing brown, ivory and grey shades here and there after the rubbing. Painter was stating this is how the uneven surface getting leveled for the next course of action. 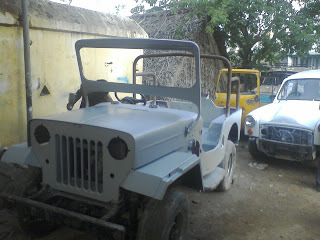 After making the jeep to this state, the crew applied Deco-pu surfacer mixed with Deco-pu hardener and Thiner. 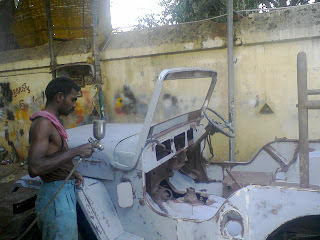 This process had dealt with the air gun painting machine. 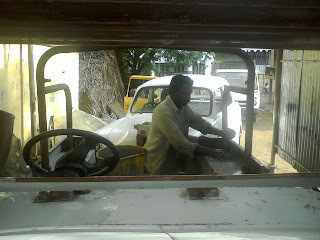 Here is how the final state of surfacer applied jeep's look in the below picture. 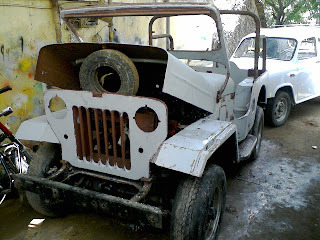 After completion of this process is what the actual coloring of the jeep. However there is a patch and fix work for the minute surface issues on this stage. That makes the jeep to get ready for the first coat of painting. The surfacer will harden the primer, metal paste and putty applied surface for the painting process.